Pillowy soft, light and fluffy – bao have become a worldwide phenomenon in recent years. Originally hailing from northern China, they’ve been around since the third century, but only became popular in the West during the past few decades. Comprised of a steamed wheat flour bun stuffed with a variety of fillings, they are slightly sweet with an incredibly satisfying and chewy texture. Our collection of bao recipes means you won’t need to rely on street food stalls or head to dedicated restaurants for your steamed bun fix. The key to great homemade bao buns is all about perfecting the dough, so be sure to check out Jeremy Pang’s Bao dough recipe to get started. After that, you can stuff pretty much anything you like into them before steaming. 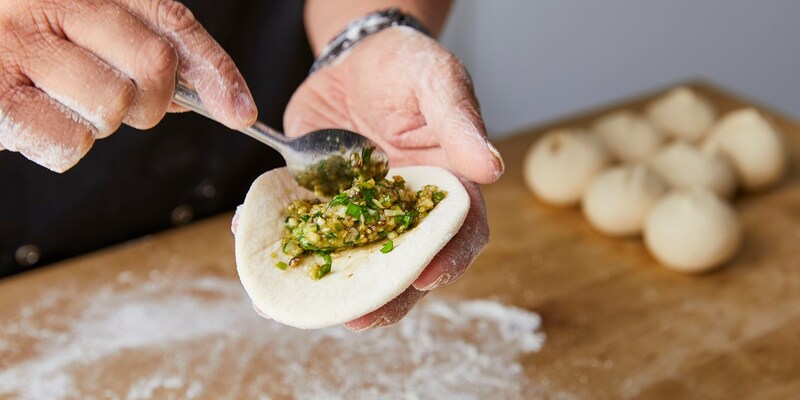 Keep things traditional with these vegetarian Spring onion, chive and mushroom bao or make your own char siu pork with Sally Abé’s Steamed bao buns. Try your hand at fusion cooking with these Southern-fried chicken bao with creamed corn and hot sauce or this Japanese-inspired recipe for Furikake fish finger bao. Finally, if you’re after something sweet, these Chocolate-filled bao are perfect, and if you’re avoiding gluten then Victoria Glass’ Gluten-free steamed buns will satisfy your bao needs without any wheat in sight. Bao come in a variety of shapes and sizes, from the traditional pleated pouches to folded over hirata and burger-style sliders. Once you’ve got your proved bao dough then experiment with different styles – in Asia you’ll even find bao made to look like little pandas.